The Wild isn’t expected to win its NHL seven-game playoff series that starts tomorrow night in Winnipeg against the Jets, but how Minnesota plays will be as scrutinized as the wins and losses. A year ago coach Bruce Boudreau’s first Wild team was listless in an opening playoff series loss against the Blues. Minnesota entered the series as the favorite but the Blues eliminated the Wild in five games. The result added to the reputation of Boudreau’s teams for not meeting expectations in the Stanley Cup playoffs. 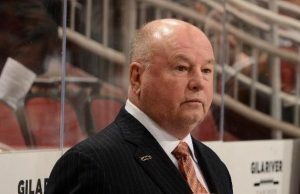 Boudreau has coached NHL teams in Minnesota, Anaheim and Washington. Whether it’s fair or not, the coach has been criticized for his playoff results in 10 prior years. Despite good regular season records his teams have never reached the Stanley Cup Finals, nor won a postseason conference title. There are always multiple perceptions about a coach and the opinion here is Boudreau has been effective with this season’s Wild team. He has juggled lines and made other maneuvers helping the Wild avoid long losing streaks. “I think he’s had a good year,” a veteran hockey source told Sports Headliners. No NHL goalie won more games than Winnipeg’s Connor Hellebuyck who totaled 44. Only seven others had a better goals against average than his 2.36 per game. The Wild will counter with goalie Devan Dubnyk who had five shutouts this season, one less than Hellebuyck. Dubnyk has been effective in 2017-2018 and might play better in the playoffs than a year ago against the Blues. Dubnkyk, according to the Sports Headliners authority, is fresher than last spring. “I think he was played way too much (during the regular season) last year,” the source said. Minnesota must try to slow down the Jets without star defenseman Ryan Suter who won’t play again until next season because of a recently fractured right ankle. Replacing his experience and the amount of minutes he is capable of playing is a challenge. The Jets finished second in the Central Division during the regular season, winning seven more games than the third place Wild. Surprises, though, happen all the time in the Stanley Cup playoffs. Perhaps the Wild can upset the Jets just like the Blues did to Minnesota a year ago. Although the Wild and the Penguins are the only NHL teams to qualify for the playoffs six consecutive seasons, Minnesota hasn’t played in the conference finals since 2003. Emotions should be intense for both teams. They certainly will be for fans because of the division rivalry and geographic proximity of the franchises. Perhaps a couple hundred Minnesota fans will cheer on the Wild tomorrow night and Friday evening in Winnipeg. When Game 3 is played on Sunday night in St. Paul there could be more than 1,000 Jets fans at Xcel Energy Center. NCAA officials like the Xcel Energy Center as a site for postseason hockey. Look for the building to host future regional and Frozen Four games. Word is the Serratore brothers, Frank and Tom, are having their names mentioned for the hockey opening at St. Cloud State. Frank is head coach at Air Force while Tom heads the program at Bemidji State. Frank once coached the St. Paul-based Minnesota Moose. Lindsay Whalen has no coaching experience but there isn’t anyone with ties to the Golden Gophers women’s program that would be as popular with fans and local media if she were named head coach. With Marlene Stollings resignation yesterday to become coach at Texas Tech, this might be the only time the Gophers and Whalen will ever have to consider her for the Minnesota job. Former Gopher football coach Glen Mason had his 68th birthday yesterday. WCCO Radio’s Dave Lee will be honored with the Bolder Options 2018 Alan and Diane Page Legacy Mentoring Award Thursday night at the Minneapolis Event Centers. The Bolder Options mentoring organization, now celebrating its 25th year, is headed by former Gopher football player Darrell Thompson. Thursday’s gala is presented by Manchester Companies. It could be that because of the wintry April, top public and private clubs won’t open for golf in the metro area until about May 1—thus placing a hit on 2018 projected budgets.